Forthbank has never been a happy hunting ground for Annan and on Saturday Annan’s fine winning streak came to an end against the leagues other in form team Stirling Albion who won their fifth game on the trot courtesy of the only goal of the game in the 77th minute when Darren Smith connected at the near post from a Callum Morrison cross. It was a very evenly contested match between two well balanced teams where scoring opportunities were at a premium with both defences playing very well. Stirling started well and in the first minute a surging run by Ross Kavanagh took him beyond Blair Currie but Swinglehurst saved the day when he cut out the attempt on goal. Annan started to take the game to the home team and efforts from Weatherson, Skelton and Omar were on target but did not seriously test keeper Chris Smith. On the half hour mark Annan were awarded a free kick and Jordan Stewart’s well struck shot beat the keeper who was rooted to the spot but the ball narrowly missed the target. Annan continued to take the game to Stirling and in the 39th minute Nathan Flanagan finished a penetrating run with an inviting low cross from which Rabin Omar forced a corner. It was a good spell from Annan and Weatherson tried his luck with a shot to the keepers top left hand side but Chris Smith in the Albion goal was alert to the effort plucking the ball out of the air. Stirling finished the half on the attack and Blair Currie was called into action pulling off two saves in quick succession to deny Ross Kavanagh and ensure the first half finished goalless. Annan forced a couple of corner kicks at the start of the second half, this was followed by a corner for Stirling and in the 54th minute Stirling’s Josh Jeffries was unlucky when his effort struck the cross bar with Blair Currie mighty relieved to see the effort cleared form the danger area. 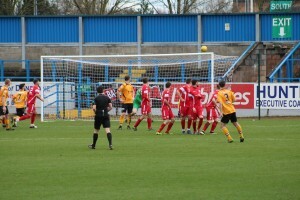 Minutes later Barry Cuddihy’s well struck shot was blocked. Both teams made changes in an effort to secure victory and ex Annan forward Blair Henderson’s low shot across the face of the goal had Blair Currie at full stretch. The winning goal was well constructed with substitute Callum Morrison setting up the chance brushing aside the challenge of Jordan Stewart on the bye line and sending over an inviting low cross which was met at the near post by Darren Smith. It was a well worked goal. Stirling’s Callum Morrison’s well struck effort went narrowly past the upright in the 81st minute. Annan finished strongly and it took a superb save from Chris Smith in the dying minutes when he denied Weatherson who’s header from Flanagan’s cross was heading for the bottom corner of the net. This was followed by another great opportunity when Weatherson set up David McKenna but the hurried effort deserved a better finish. The victory ensures Stirling have a real chance of making the play offs. It was another good day for Arbroath who defeated Berwick 2-0 at Shielfield and with Elgin and Forfar sharing the points in a 1-1 draw it now means Forfar are only one point ahead of Arbroath in the race for the title, Cowdenbeath now look firm favourites to finish bottom of the league following their 2-0 home defeat at the hands of Montrose especially after Clyde lifted the points with a 3-1 home victory over Edinburgh City. Stirling Albion : Chris Smith, Ross McGeachie, Conor Quigley , Ross Smith ( Frazer Wright 71min), Andrew Black, Josh Jeffries (Callum Morrison 60min), Darren Smith , Connor McLaren (Blair Henderson 60 min), Connor McMullan, Sean Dickson, Ross Kavanagh. Substitutes not used Cammy Vinnie GK, Darren Petrie, Jamie Mills, Ross Forsyth. Annan Athletic : Blair Currie,, Jean Guy Lucas, Jordan Stewart , Raffi Krissian, ,Stephen Swinglehurst, Gavin Skelton (Aidan Smith78 min), Max Wright (David McKenna 85 min), Barry Cudihy (Tom Fry 65 min), Nathan Flanagan, Peter Weatherson, Rabin Omar, Nathan Flanagan. Substitutes not used – Alex Mitchell Adam, Stephen Bronskey, Callum Home, Przemyslay Dachnowicz. Referee: David Munro, Assistants: Michael Banks & Craig Ferguson.